I have to admit there is something different about this one, Red She-Hulk: Route 616. First, it is written by Jeff Parker whom Agents Daniel and Ben enjoy over at the distinguished competition with Aquaman. Second, this volume mostly paints S.H.I.E.L.D. as somewhat the bad guys as they hunt the title character. And finally, the highest-ranking S.H.I.E.L.D. agent is Nikola Tesla! 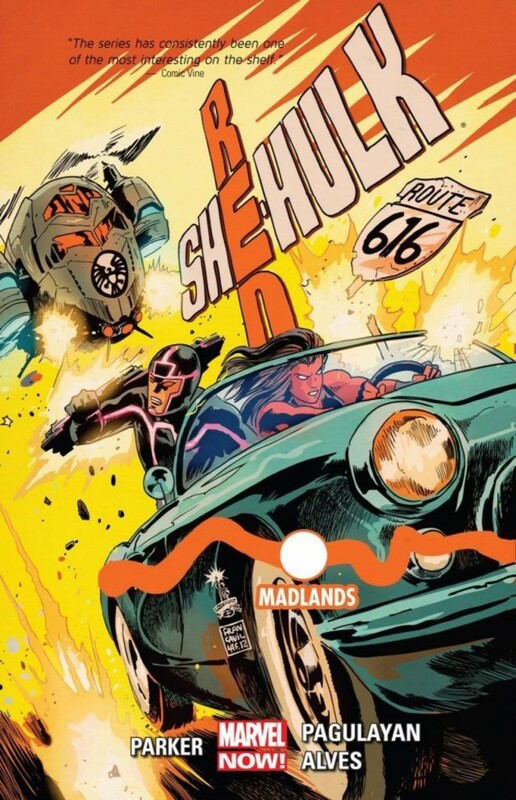 Red She-Hulk, Betty Ross, and Machine Man are on the run from S.H.I.E.L.D. and the Avengers as the duo try to save the world from an predicted apocalypse. Her target Echelon, a U.S. military group of Super Soldiers, goes on the offensive and launches a nationwide manhunt going so far as to call in the Hulk experts S.H.I.E.L.D.. The chase takes the heroes from underground caverns, to Mount Rushmore, a secret S.H.I.E.L.D. base and Marvel Universe 616.1. Can Betty save our world from the horrible predictions that she has seen, through the eyes of a child? Parker is first and foremost the king of monsters. He is doing it every month it seems at DC. And now in this volume we get a giant Annelid, Megatu, which actually eats and excretes! And there are a number of sub-terraan deviants, including the Mole Monster their king, showing off their monster side. In fact the very efficient Machine Man determines that Betty and he will face 7,000 monsters at one point. Seriously Parker loves him some monsters. And then there is the horrible Yologarch, which I will not spoil for you, but you will agree is a 4 times evil monster. And just for good measure let us throw in Man-Thing (yeah Ben, Man-Thing)! And that is not even counting the fact that Parker is writing about Hulks with three of them in this one volume! I really do enjoy Parker writing in the Marvel Universe. His Agents of Atlas was fantastic, and one of the best-assembled collections ever. Like that story, Parker builds on mythology established elsewhere. In this case he builds on Jonathan Hickman’s Ancient Order of the Shield, the real power behind S.H.I.E.L.D. (when it is not Hydra). In this story it is Telsa, or holograms of Telsa, that represent those who behind the scenes are working to save the world for centuries. And we get a glimmer of hope, which I am guessing will not be fulfilled soon, that the Ancient Agents may have an expanded role in the future. Machine Man, I will admit I do not know you a lot. Recently Agent Ben exposed me to his origin. So this is me taking a dip into his story. I find that I do like Aaron. He is a loyal companion who despite being a machine made an illogical choice in allying himself with Red She-Hulk and becoming a fugitive. Machine Man turned his back on the Avengers and I am pretty sure his ID card no longer works at the finer restaurants. He does not miss much, 7,000 monsters Betty. Again despite being a machine he appears very curious to me. I think he enjoys the mystery of what he is uncovering. And when his programming kicks in and makes him take actions that contradict his free will you do feel pain for him. We do get some additional insight into S.H.I.E.L.D. agent Bruce Banner. He sometimes hits the creative wall. And when he does, going Green is always a good idea. It seems a little smashing really helps him clear the mental pathways and opens himself up to new discoveries. This really helps explain his actions in Indestructible Hulk: Humanity Bomb. Goodbye Red She-Hulk as your journey into the very familiar Universe 616.1 was your last adventure. Parker does give hints to other ideas that he has for Betty Ross which are S.H.I.E.L.D. heavy and have real promise. But until I see Mockingbird and Daisy Johnson hit the pages again I will keep my expectations low! Seriously, with her being cast on Tuesday nights Mockingbird has to make a return soon, right?